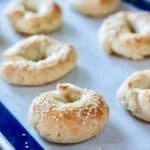 Flour and yogurt are the base for these no yeast, super easy to make bagels! This recipe is a larger version that makes 8 ...more bagels! Add yogurt and mix. I like to use my Kitchen Aid for this but any mixer or just your hands will work. Cut into 8 pieces. Roll each piece into about a 5" piece and form a circle. Pinching the ends. Brush with beaten egg and top with your favorite toppings like sesame or salt flakes. Use a good plain fat free yogurt like Fage' or Chobani. Stir so no liquid remains before using. This dough makes great pizza, rolls or even pretzel shapes!